The First Bulgarian Empire (Modern ) was a medieval Bulgarian state founded in AD 632 in the lands near the Danube Delta and disintegrated in AD 1018 after its annexation to the Byzantine Empire. At the height of its power it spread between Budapest and the Black Sea and from the Dnieper river in modern Ukraine to the Adriatic . It was succeeded by the Second Bulgarian Empire, established in 1185. The official name of the country since its very foundation was Bulgaria. The Empire played a major role in European politics and was one of the strongest military powers of its time. In 717–718 the coalition of Byzantines and Bulgarians decisively defeated the Arabs in the siege of Constantinople thus saving Eastern Europe from the threat of an Arab invasion and Muslim conquest of Europe, and later destroyed the Avar Khanate expanding its territory to the Pannonian Plain and the Tatra Mountains . Bulgaria served as an effective shield against the constant invasions of nomadic peoples from the east in the so called second wave of the Great Migration. Pechenegs and Cumans were stopped in north-eastern Bulgaria and after a decisive victory over the Magyars in 896 they were forced to retreate to and permanently settle down in Pannonia. To the south in course of the Byzantine–Bulgarian Wars the Bulgarians incorporated most of Slavic-populated region of Thrace and Macedonia. After the annihilation of the Byzantine army in the battle of Anchialus in 917 the Byzantine Empire was on the edge of destruction. The Bulgars brought new construction and battle techniques to Europe. The first Bulgarian cities were made of large monolith stones unlike the Roman brick-build fortresses. With an area of 27 km² the capital Pliska was among the largest towns in Europe. The Inner town had a sewerage and floor heating long before cities such as Paris and London . After the adoption of Christianity in 864 Bulgaria became the cultural center of Slavic Europe. Its leading cultural position was further consolidated with the invention of the Cyrillic alphabet in Preslav , with some credit to the Bulgarian scholar Clement of Ohrid. According to some historians the schools of Preslav and Ohrid were the second universities in Europe after the University of Constantinople. Little is known about the origins of the Bulgars that reached the Balkan peninsula in the 7th century (according to some sources even earlier) because during the ages the original Bulgars melded into the local population of what is nowadays Bulgaria. The established theory is that the Bulgars are related to the Huns and originated in Central Asia but their ethnicity is not entirely clear. Clues for this can be found in the advanced calendar and system of government of the early Bulgars. In the 6th and 7th century, the Bulgars formed an independent state, often called Great Bulgaria, between the lower course of the Danube to the west, the Black and the Azov Seas to the south, the Kuban river to the east, and the Donets river to the north. The capital of the state was Phanagoria , on the Azov. The pressure from peoples further east (such as the Khazars) led to the dissolution of Great Bulgaria in the second half of the 7th century. There are two different dates for the year of establishment of present-day Bulgaria, based upon two different interpretations of history. Yet another Bulgar tribe, led by Khan Asparuh, moved westward, occupying today's southern Bessarabia . After a successful war with Byzantium in AD 680, Asparuh's khanate conquered Moesia and Dobrudja , and was recognised as an independent state under the subsequent treaty signed with the Byzantine Empire in AD 681. The same year is usually regarded as the year of the establishment of present-day Bulgaria. After the decisive victory at Ongala in 680 the armies of the Bulgars and Slavs advanced to the south of the Balkan mountains, defeating again the Byzantines who were then forced to sign a humiliating peace treaty which acknowledged the establishment of a new state on the borders of the Empire. They were also to pay an annual tribute to Bulgaria. In the same time the war with the Khazars to the east continued and in 700 Asparough perished in battle with them. The Bulgars lost the territories to the east of the Dnester river but managed to hold the lands to the west. The Bulgars and the Slavs signed a treaty according to which the head of the state became the Khan of the Bulgars who had also the obligation to defend the country against the Byzantine, while the Slavic leaders gained considerable autonomy and had to protect the northern borders along the Carpathian mountains against the Avars. Asparuh's successor, Tervel helped the deposed Byzantine Emperor Justinian II to regain his throne in 705. In return he was given the area Zagore in northern Thrace which was the first expansion of the country to the south of the Balkan mountains. However, three years later Justinian tried to take it back by force but his army was defeated at Anchialus. In 716 Tervel signed an important agreement with Byzantium. During the siege of Constantinople in 717–718 he sent 50,000 troops to help the besieged city. In the decisive battle the Bulgarians massacred around 30,000 Arabs and Tervel was called The saviour of Europe by his contemporaries. In 753 died Khan Sevar who was the last scion of the Dulo clan. With his death the Khanate fell into a long political crisis during which the young country was on the verge of destruction. For just 15 years ruled 7 Khans who were all murdered. There were two main fractions; some nobles wanted uncompromising war against the Byzantines while others searched for a peaceful settlement of the conflict. That instability was used by the Byzantine Emperor Constantine V (745–775) who launched nine major campaigns aiming at the elimination of Bulgaria. In 763 he defeated the Bulgarian Khan Telets at Anchialus but the Byzantines were unable to advance further north. In 775 Khan Telerig, by tricking Constantine to reveal those loyal to him in the Bulgarian Court, executed all the Byzantine spies in the capital Pliska. Under his successor Kardam, the war took a favourable turn after the great victory in the battle of Marcelae in 792. The Byzantines were thoroughly defeated and forced once again to pay tribute to the Khans. As a result of the victory, the crisis was finally overwhelmed and Bulgaria entered the new century stable, stronger and consolidated. Under the great Khan Krum (803–814), also known as Crummus and Keanus Magnus, Bulgaria expanded northwest and southwards, occupying the lands between middle Danube and Moldova , the whole territory of present-day Romania , Sofia in 809 and Adrianople (modern Odrin ) in 813, and threatening Constantinople itself. Between 804 and 806 the Bulgarian armies thoroughly eliminated the Avar Khanate and a border with the Frankish Empire was established along the middle Danube. In 811 a large Byzantine army was decisively defeated in the battle of the Varbitsa Pass. The Byzantine Emperor Nicephorus I was slain along with most of his troops and his skull was used as a drinking cup. Krum immediately took the initiative and moved the war towards Thrace, defeating the Byzantines once more at Versinikia in 813. After a treacherous Byzantine attempt to kill the Khan during negotiations, Krum pillaged the whole of Thrace, seized Odrin and resettled its 10,000 inhabitants in "Bulgaria across the Danube". He made enhanced preparation to capture Constantinople: 5,000 iron-plated waggons were built to carry the siege equipment, the Byzantines even pleaded for help from the Frankish Emperor Louis the Pious. Due to the sudden death of the great Khan, however, the campaign was never launched. Khan Krum implemented law reform intending to reduce the poverty and to strengthen the social ties in his vastly enlarged state. Khan Omurtag (814–831) concluded a 30-year peace treaty with the Byzantines thus allowing both countries to restore their economy and finance after the bloody conflicts in the first decade of the century. During his the northwestern boundaries with the Frankish Empire were firmly settled along the middle Danube by the 827. Extensive building was undertaken in the capital, Pliska, which included the construction of a magnificent palace, pagan temples, ruler's residence, fortress, citadel, water-main and bath; mainly of stone and brick. During the short reign of Malamir (831–836) the important city of Plovdiv was incorporated into the country. Under Khan Presian (836–852), the Bulgarians took most of Macedonia and the borders of the country reached the Adriatic and Aegean Seas . The Byzantine historians do not mention any resistance against the Bulgarian expansion in Macedonia which bring the conclusion that it was largely peaceful. Between 839 and 842 the Bulgarians waged war on the Serbs but did not make any progress for three years. It is assumed that the Bulgars were greatly outnumbered by the Slav population among whom they had settled. Between the 7th and the 10th centuries, the Bulgars were gradually absorbed by the Slavs, adopting a Bulgaro-South Slav language and converting to Christianity (of the Byzantine rite) under Boris I in 864. At that time the process of absorption of the remnants of the old Romanised Thracian population from south of the Danube had already been significant in the formation of this new ethnic group. Modern Bulgarians are normally considered to be of Southern Slavic origin, even though the Slavs were only one of the people that took part in the formation of Bulgarian ethnicity. 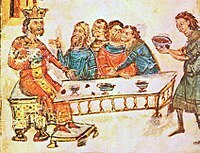 The reign of Boris I (852–889) began with numerous setbacks. For ten years the country fought against the Byzantine and Eastern Frankish Empires, Great Moravia, the Croats and the Serbs forming several unsuccessful alliances and changing sides. In August 863 there was a period of 40 days of earthquakes and there was a lean year which caused famine throughout the country. To cap it all there was an incursion of locusts. In 864 the Byzantines under Michael III invaded Bulgaria on suspicions that Khan Boris I prepared to accept Christianity in accordance with the Western rites. Upon the news of the invasion, Boris I started negotiations for peace. The Byzantines returned some lands in Macedonia and their single demand was that he accept Christianity from Constantinople rather than Rome. Khan Boris agreed to that term and was baptised in September 865 assuming the name of his godfather, Byzantine Emperor Michael. But, it is a document in Albania found by Austrian archaeologist during the WWI, Camillo Praschniker in Byllis, Ballsh (in today Albania) that say: (evaftiste o arhon Bulgarias Boris o metonomastheis Mihail sin to ek Theu dhedhomeno av to ethnei tous s t o d) "...was baptize the arhon of Bulgaria, Boris, called Mihal together with his people gived to him by God, Year 6374" (=866 AD) The pagan title "Khan" was abolished and the title "Knyaz" assumed in its place. The reason for the conversion to Christianity, however, was not the Byzantine invasion. The Bulgarian ruler was indeed a man of vision and he foresaw that the introduction of a single religion would complete the consolidation of the emerging Bulgarian nation which was still divided on a religious basis. He also knew that his state was not fully respected by Christian Europe and its treaties could have been ignored by other signatories on religious basis. Тhe Byzantines' goal was to achieve with peace what they were unable to after two centuries of warfare: to slowly absorb Bulgaria through the Christian religion and turn it into a satellite state, as naturally, the highest posts in the newly founded Bulgarian Church were to be held by Byzantines who preached in the Greek language. Boris was well aware of that fact and after Constantinople refused to grant autonomy of the Bulgarian Church in 866 he sent a delegation to Rome declaring his desire to accept Christianity in accordance with the Western rites along with 115 questions to Pope Nicolas I. The Bulgarian ruler desired to take advantage of the rivalry between the Churches of Rome and Constantinople as his main goal was the establishment of an independent Bulgarian Church in order to prevent both the Byzantines and the Catholics from exerting influence in his lands through religion. The Pope's detailed answers to Boris' questions were delivered by two bishops heading a mission whose purpose was to facilitate the conversion of the Bulgarian people. However, Nicolas I and his successor Pope Adrian II also refused to recognize an autonomous Bulgarian Church which cooled the relations between the two sides but Bulgaria's shift towards Rome made the Byzantines much more conciliatory. In 870, at the Fourth Council of Constantinople, the Bulgarian Church was recognized as an Autonomous Eastern Orthodox Church under the supreme direction of the Patriarch of Constantinople. Although the Bulgarian Knyaz succeeded in securing an autonomous Church, its higher clergy and theological books were still Greek which impeded the efforts to convert the populace to the new religion. Between 860 and 863 the Byzantine monks of Greek origin Saint Cyril and Saint Methodius created the Glagolitic alphabet, the first Slavic alphabet by order of the Byzantine Emperor, who aimed to convert Great Moravia to Orthodox Christianity. However these attempts failed and in 886 their disciples Clement of Ohrid, Naum of Preslav and Angelarius, who were banished from Great Moravia, reached Bulgaria and were warmly welcomed by Boris I. The Bulgarian Knyaz commissioned the creation of two theological academies to be headed by the disciples where the future Bulgarian clergy was to be instructed in the local vernacular. Clement was sent to Ohrid in southwestern Bulgaria where he taught 3,500 pupils between 886 and 893. Naum established the literary school in the capital Pliska, moved later to the new capital Preslav . In 893, Bulgaria adopted the Glagolitic alphabet and Old Church Slavonic (Old Bulgarian) language as official language of the church and state and expelled the Byzantine clergy. In the early 10th century the Cyrillic alphabet was created at the Preslav Literary School. By the late 9th and the beginning of the 10th century, Bulgaria extended to Epirus and Thessaly in the south, Bosnia in the west and controlled the whole of present-day Romania and eastern Hungary to the north. With Byzantine support, a Serbian state came into existence in the mid-ninth century as a response to the Bulgarian expansion west of the Morava. Switching loyalties between Bulgaria and the Byzantines, the Serb rulers successfully resisted several Bulgarian invasions until 924 A.D., when it was fully subordinated under the general and possibly Count of Sofia Marmais. Under Tsar Simeon I (Simeon the Great), who was educated in Constantinople, Bulgaria became again a serious threat to the Byzantine Empire and reached its greatest territorial extension. Simeon hoped to take Constantinople and fought a series of wars with the Byzantines throughout his long reign (893–927). The border close to the end of his rule reached Peloponnese in the south. Simeon styled himself "Emperor (Tsar) of the Bulgarians and Autocrat of the Greeks", a title which was recognized by the Pope, but not of course by the Byzantine Emperor nor the The Ecumenical Patriarch of the Eastern Orthodox Church. He was recognized "Emperor (Tsar) of the Bulgarians" by the Byzantine Emperor and the Patriarch only at the end of his rule. Between 894 and 896 he defeated the Byzantines and their allies the Magyars in the so called "Trade War" because the pretext of the war was the shifting of the Bulgarian market from Constantinople to Solun. In the decisive battle of Bulgarophygon the Byzantine army was routed and the war ended with favourable for Bulgaria peace which was, however, often violated by Simeon. In 904 he captured Solun which was previously looted by the Arabs and returned it to the Byzantines only after Bulgaria received all Slavic-populated areas in Macedonia and 20 fortress in Albania including the important town Drach . After the unrest in the Byzantine Empire that followed the death of Emperor Alexander in 913 Simeon invaded Byzantine Thrace but was persuaded to stop in return for official recognition of his Imperial title and marriage of his daughter to the infant Emperor Constantine VII. After a plot in the Byzantine court Empress Zoe rejected the marriage and his title and both sides prepared for a decisive battle. By 917 Simeon broke every attempts of his enemy to form an alliance with the Magyars, the Pechenegs and the Serbs and Byzantines were forced to fight alone. On 20 August the two armies clashed at Anchialus in one of the greatest battles in the Middle Ages. The Byzantines suffered an unprecedented defeat leaving 70,000 killed on the battlefield. The pursuing Bulgarian forces defeated the reminder of the enemy armies at Katasyrtai. However, Constantinople was saved by a Serb attack from the west; the Serbs were thoroughly defeated but that gave precious time for the Byzantine admiral and later Emperor Romanos Lakepanos to prepare the defense of the city. In the following decade the Bulgarians gained control of the whole Balkan peninsula with the exception of Constantinople and Pelopones . After Simeon's death, however, Bulgarian power slowly declined. In a peace treaty in 927 the Byzantines officially recognized the Imperial title of his son Peter I and the Bulgarian Patriarchate. The peace with Byzantium did not bring prosperity to Bulgaria. In the beginning of his rule the new Emperor had internal problems and unrest with his brothers and in 930s was forced to recognize the independence of Rascia. The main blow came from the north: between 934 and 965 the country suffered five Magyar invasions. In 944 Bulgaria was attacked by the Pechenegs who looted the north eastern regions of the Empire. Under Peter I and Boris II the country was divided by the egalitarian religious heresy of the Bogomils. In 968 the country was attacked by Kievan Rus, whose leader, Svyatoslav I, took Preslav and established his capital at Preslavets . Three years later, Byzantine Emperor John I Tzimiskes interfered into the struggle and defeated Svyatoslav at Dorostolon. After that, Boris II was deceived and solemnly dethroned at Constantinople and eastern Bulgaria was proclaimed a Byzantine protectorate. After the Byzantine betrayal the lands to the west of the Iskar river remained free and the resistance against the Byzantines was headed by the Comitopuli brothers. By 976 the forth brother Samuil concentrated the whole power in his hands after the deaths of his eldest brothers. When the rightful heir to the throne, Roman, escaped from captivity in Constantinople, he was recognized for Emperor by Samuil in Vidin and the later remained the chief commander of the Bulgarian army. Brilliant general and good politician, he managed to turn the fortunes to the Bulgarians. The new Byzantine Emperor Basil II was decisively defeated in the battle of the Gates of Trajan in 986 and barely escaped. Five years later he eliminated the Serbian state. In 997 after the death of Roman who was the last from the Krum dynasty Samuil was proclaimed Emperor of Bulgaria. However, after 1001 the war turned in favour of the Byzantines who captured the old capitals Pliska and Preslav in the same year and from 1004 launched annual campaigns against Bulgaria. They were eased by a war between Bulgaria and the newly established Kingdom of Hungary 1003. In 1014 Emperor Basil II defeated the armies of Tsar Samuil in the Battle of Belasitsa and massacred thousands, acquiring the title "Bulgar-slayer" (Voulgaroktonos). He ordered 14,000 Bulgarian prisoners blinded and sent back to their country. At the sight of his returning armies Samuil suffered a heart attack and died. By 1018 the country had been mostly subjugated by the Byzantines. The cultural heritage of the First Bulgarian Empire is usually defined in Bulgarian historiography as the Pliska-Preslav culture named after the first two capitals Pliska and Preslav where most of the surviving monuments are concentrated. Many monuments of that period have been found around Madara, Shumen , Novi Pazar , the village of Han Krum in north-eastern Bulgaria, as well in the territory of modern Romania where the Romanian archaeologists called it the Dridu culture Remains left by the First Empire have been discovered in southern Bessarabia , now divided between the Ukraine and Moldova . Ceramic icon of St. Theodor, Preslav, ca. AD 900, National Archaeological Museum, Sofia. One of the most famous features of the Pliska-Preslav culture was the decoration of palaces and churches with lacquered ceramic plates which was unparalleled in the Byzantine and Western European art. It is assumed that it has Asian origin which proves the unique mixture of styles in the Bulgarian culture between 8th and 10th century. The ceramic plates were painted with geometric or vegetative elements. They were arranged to form friezes of repeating motifs. Due to the destruction of Pliska and Preslav only fragments and details of the ceramic decoration have survived. The artists created ceramic icons which depicted saints and angels. One of the few well-preserved examples is the Icon of St Theodor found in the ruins of the Saint Pantaleymon Monastery in the outskirts of Preslav. The main source for the Bulgarian pottery for domestic needs are the nercopolae in Novi Pazar, Devnya and Varna . The vessels were made with potter's wheel unlike the Slavs. Two-storey ovens were used for the annealing of the pottery. The shape and decoration of the early Bulgarian pottery was similar to that in northern Caucasus, Crimea and the shores of the Sea of Azov . Delev, Bǎlgarskata dǎržava pri car Simeon. Златарски, История на Първото българско царство, с. 316. Златарски, История на Първото българско царство, с. 321. Бакалов, История на България, "Симеон І Велики"
Гильфердинг, А (1868). Письма об истории сербов и болгар (in Russian), p. 209.